When it comes to LED Christmas Lights, the lens design options are impressive. But at the same time it's confusing as to which design works best in various lighting applications. We receive a lot of calls and emails from customers that are overwhelmed by the number of options available for LED Christmas lights. It wasn't that long ago that Christmas lights were broken down into two basic designs: The classic mini light and the larger C7 or C9 bulb light sets. 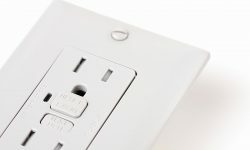 Now days there are a lot more options, which while it can be confusing, it also gives everyone a much broader range of options to help them create unique lighting projects for their homes or business. 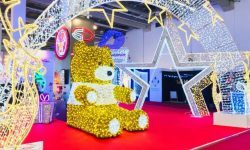 Let's take a look at the most common LED Christmas light lens designs. The 5 mm Wide Angle Conical LED light set is the #1 LED set that we sell. While the actual bulb design is not as long as a traditional style Christmas light, but the illumination intensity and the overall look of the light set, once it is lit up, is nearly identical to the type of Christmas mini light that most of us have used for many years. The Wide Angle Conical is especially suited for outdoor lighting applications where maximum intensity is needed. However, when used for indoor projects such as lighting Christmas trees, the brightness of the bulbs can be overwhelming. The lens design of the M5 LED light set is nearly identical to that of traditional incandescent mini lights. The M5 is a popular choice for both indoor as well as outdoor lighting. The overall intensity is not as bright as the Wide Angle Conical, but it does provide a more balanced illumination. 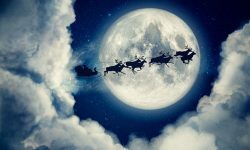 For this reason the M5 is a popular choice for interior artificial green lighting such as wreaths, trees and garlands. C3 light sets are not nearly as common as their M5 and Conical counterparts, but that doesn't mean they aren't a good choice for a wide variety of lighting applications. Here at Christmas Designers the C3 is one of our favorite style of lights to use when lighting artificial greens. We also often encourage our customers to use them for outdoor foliage lighting. 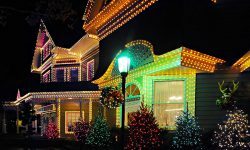 Because it is not as popular as some of the other styles of lights, it gives people the chance to string up a unique style of lights that will set their lighting project apart from everyone else's. G12s have been rapidly growing in popularity and are being used more and more for outdoor foliage lighting. The round LED lens offers a unique look that many people find appealing. The G12 also makes a good choice for interior artifical foliage lighting. 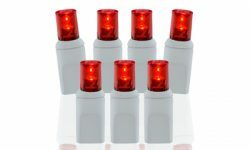 C6 light sets have been around for a long time but did not enjoy wide spread usage until recently when the very low electrical draw of LEDs made these a popular style of lens design. The lens is too small to use for perimeter building lighting, but because C6s are larger than a traditional mini light, they are a great choice for scatter lighting in hedges and tree foliage. They also look great in artificial wreaths, trees and garlands. C9 light sets are often confused with C7s. Both have a similar lens design, but due to the larger size of the C9, it is the most popular choice for perimeter lighting and occasionally for scatter lighting large evergreen trees. Similarly to their C7 counterpart, C9s have traditionally used a lot of power. Anywhere from 7 to 10 watts was required to power an incandescent C9 bulb. When it comes to LEDs, both C7 and C9s require the same amount of power, which is significantly lower than standard incandescent bulbs. For this reason, we sell more C9s since they do have a larger lens which in turn increases visibility, especially when using retrofit bulbs, which tend to be brighter than C9 stringer sets. Picking the best lens style for your own lighting project comes down to personal preference. If you want to go with the most popular style of lighting, then a 5 mm Wide Angle Conical is a great choice for foliage lighting and a C9 set is perfect for perimeter lighting. But if you prefer something a little different, then perhaps a C3 or C6 would give your project that unique look that shows everyone you prefer to mix things up a bit. 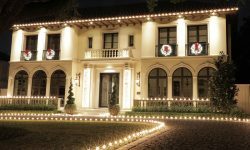 Whether you're the bold type or prefer to follow a more conservative path, ChristmasDesigners.com has the perfect light set for your Christmas lighting needs.